Whilst the 1% average annual risk of MGUS developing into MM or a related condition is well documented  progression among individual MGUS patients is highly variable . Therefore, recognition of risk factors for progression is of clear benefit. Not only does this allow the identification of patients at highest risk, who will benefit most from close monitoring, it also provides reassurance to patients at low risk who do not need to be subjected to further tests. A summary of known risk factors is presented in Table 13.1. Table 13.1. Summary of risk factors for MGUS progression identified by multivariate analysis. Yes: significant risk factor; No: non-significant risk factor; uBJP: urinary Bence Jones protein; aPC: aberrant plasma cells; BMPC: bone marrow plasma cells; HLC: immunoglobulin heavy/light chain (Hevylite); ESR: erythrocyte sedimentation rate. In one of the largest studies to date, the long-term outcome of 1384 individuals in southeastern Minnesota with IgM and non-IgM MGUS was assessed by Kyle et al. . Patients enrolled between 1960 and 1994 were initially followed up for a median of 15.4 years, and subsequently for a median of 34.1 years (range: 0 – 43.6 years). During this time 147 (11%) progressed to MM or a related condition, a rate of approximately 1% per year . This represented a 6.5-fold increased risk compared to a matched control population. When the individual types of MGUS were considered separately, the risk of progression for IgM MGUS was higher than that of non-IgM MGUS (relative risk: 10.8 vs. 5.7). Interestingly, the risk of progression for IgM MGUS was not constant; the risk was highest in the first decade following diagnosis (2.0% per year), and then reduced to 1.3% per year thereafter. In contrast, the risk of progression for non-IgM MGUS remained unchanged throughout. 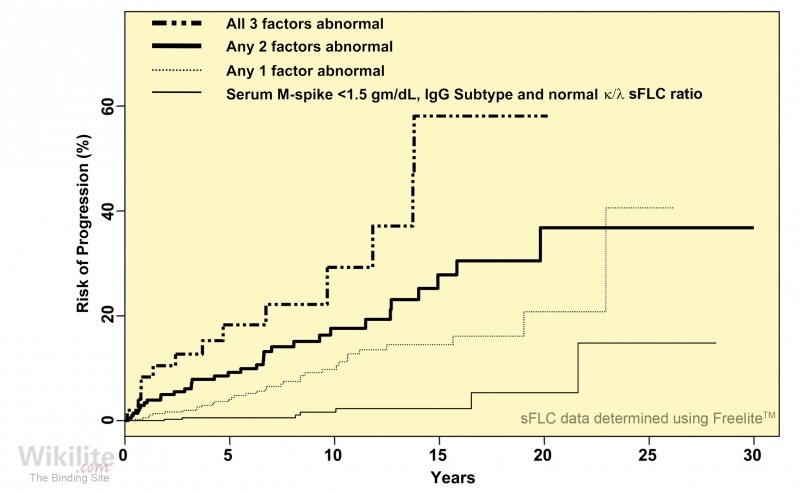 Once the serum M-protein type had been taken into account, the most important prognostic factors for progression were the initial size of the serum monoclonal protein (>15 g/L) and an abnormal sFLC ratio . 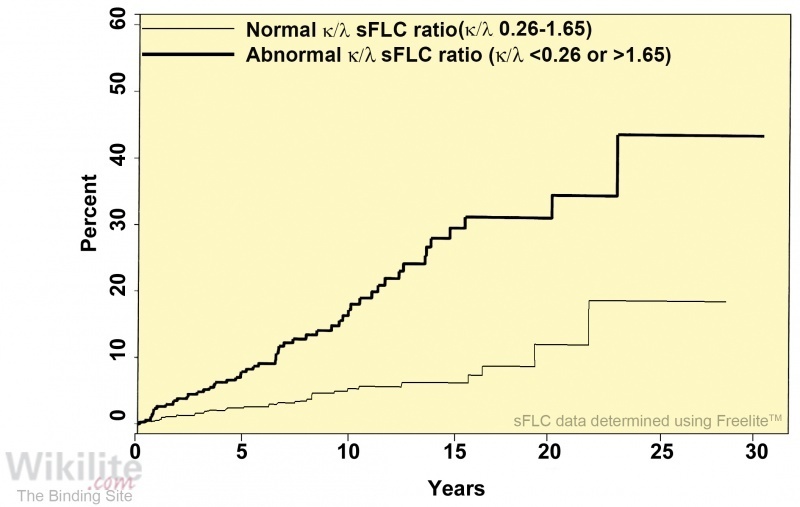 The prognostic value of sFLCs in the Minnesota MGUS cohort was first described in a separate article by Rajkumar et al. , discussed below. Figure 13.4. Risk of progression of MGUS to MM using a risk stratification model that incorporates HLC-pair suppression. Prognostic factors defined in Table 13.5. (This research was originally published in Leukemia  Reproduced with permission from nature.com). Figure 13.5. Incidence of HLC pair suppression versus classical immunoparesis in MGUS patients. MGUS risk stratification model, patients are grouped according to Rajkumar et al. . *p<0.05; **p<0.005. There is a tendency for HLC pair suppression to be more frequent than classical immunoparesis, reaching significance for two of the four risk groups, *p<0.05  (Courtesy of J. Jimenez). Suppression of uninvolved, polyclonal immunoglobulins (classical immunoparesis) has been identified as a risk factor of MGUS progression in some , but not in all studies . Using HLC immmunoassays, it is possible to measure the isotype-specific suppression of the uninvolved HLC pair (e.g. suppression of IgAλ in an IgAκ patient) (Section 11.2). Emerging evidence suggests that this ‘HLC pair suppression’ may have prognostic importance in MGUS patients. In a preliminary study, Katzmann et al. analysed HLC results from 105 IgG and 28 IgA MGUS patients. For the purposes of analysis the samples were separated into 3 different groups: initial samples from patients with stable MGUS, initial samples from patients with MGUS which progressed, and samples collected shortly before progression was diagnosed (Table 13.3). For the IgG MGUS patients, HLC ratio abnormalities and HLC pair suppression were increased in patients at greater risk of progression and the pair suppression was greater than the general immunoparesis. For the IgA MGUS patients the results were clearly different; ratio abnormalities were close to 100% in all groups and while HLC pair suppression was higher in subjects at greater risk of progression, the frequency of general immunoparesis was almost identical (Table 13.3). Table 13.3. HLC pair suppression compared to classical immunoparesis in IgG and IgA MGUS . Suppression is defined as below the lower limit of the normal reference range. * Initial diagnostic sera from Olmsted County study of MGUS; ** pre-MM sample from NIH PLCO cohort. In a second and much larger study, Katzmann et al. investigated the prognostic significance of HLC analysis utilising 999 MGUS patient samples taken at diagnosis. These were cryopreserved sera collected from the 1384 MGUS patients who had participated in the earlier, Kyle et al. MGUS study . 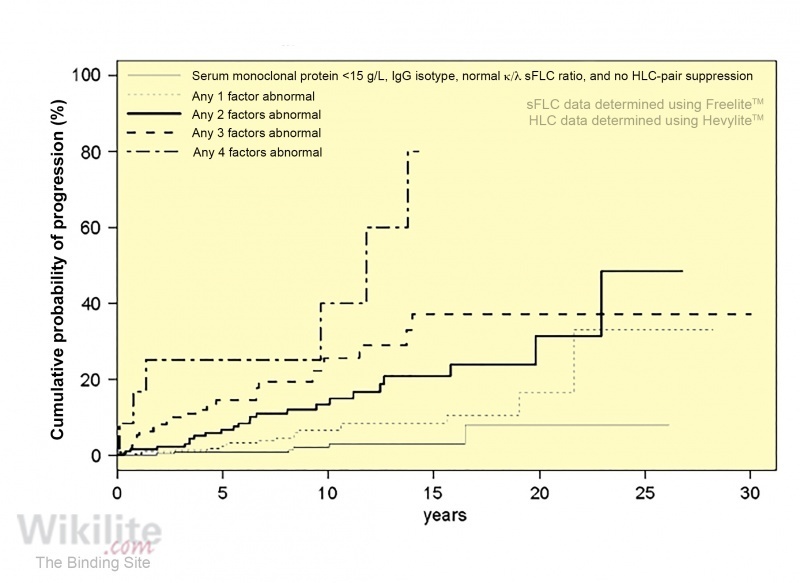 An abnormal HLC ratio was identified in two-thirds of patients. The frequency depended on the monoclonal protein isotype (Table 13.4): an abnormal HLC ratio was present in at least 90% of IgA and IgM MGUS patients, but in only 56% of IgG MGUS patients. The insensitivity of IgG HLC for IgG MGUS is thought to be due to the higher concentration of background polyclonal IgG compared with IgA and IgM (Section 11.5.3). HLC pair suppression (defined as an uninvolved HLC concentration below the lower normal limit) was present in 27% of patients overall, this represented a higher frequency than classical immunoparesis, which was present in only 11% of cases. Table 13.4. Frequency of abnormal HLC ratios and HLC pair suppression in IgG, IgA and IgM MGUS . In univariate analysis, Katzmann et al. showed that HLC pair suppression and abnormal HLC ratios were both significantly associated with an increased risk of progression to MM (both p <0.001). 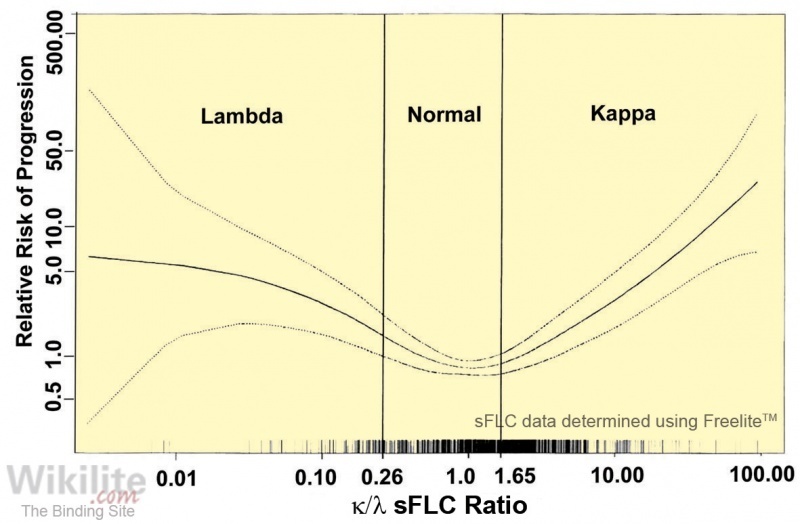 On multivariate analysis, HLC pair suppression remained significantly associated with progression to MM or a related condition, along with monoclonal protein size, type and an abnormal κ/λ sFLC ratio (Table 13.5). A risk-stratification model was developed to include these variables in which patients are categorised into five groups, according to the number of risk factors (0, 1, 2, 3 or 4) they possess. The probability of progression to MM increased with the number of risk factors (Figure 13.4). MM identified by multivariate analysis . Supportive data were reported by Jiménez et al. and Pika et al. . In the initial study by Jiménez et al. , 248 MGUS patients were initially grouped as low- to high-risk based on the Rajkumar et al. MGUS risk stratification model . The incidence of HLC pair suppression increased with MGUS risk group (Figure 13.5). Moreover, in IgG MGUS patients, both the HLC ratio and the degree of HLC pair suppression became more extreme in higher risk groups (Figure 13.6). In a follow-on study of 154 MGUS patients by the same group , patients with severe HLC pair suppression (defined as values 50% below the lower limit of normal) were found to have a higher risk of malignant progression during follow-up than those without severe HLC pair suppression (p=0.024). In contrast, the presence of classical immunoparesis was not prognostic. 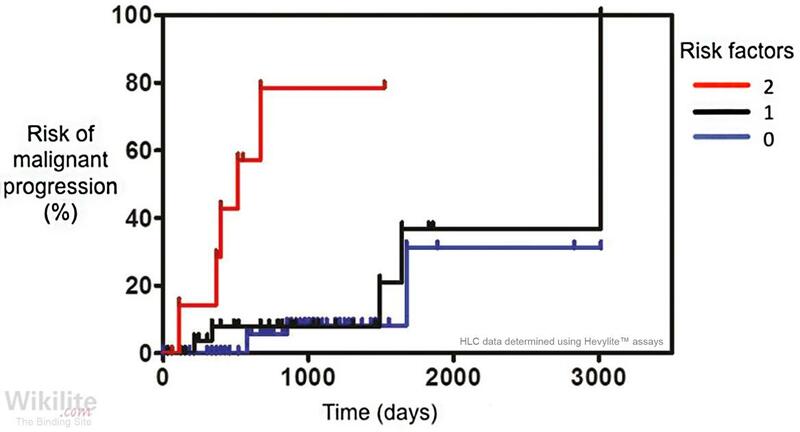 The authors developed a risk-stratification model based on two HLC parameters: the involved HLC concentration (>15 g/L) and presence of severe HLC pair suppression Figure 13.7). A total of 8 patients had both risk factors, and this was associated with a significantly shorter time to progression compared to that of the remaining group (median: 17 months vs. 100 months, p<0.0001). Espiño et al. 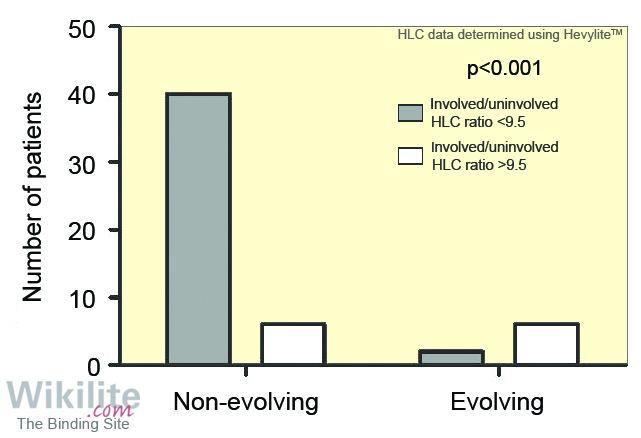 found that in IgG MGUS patients, the frequency of involved/uninvolved HLC ratios above 9.5 correlated with the classification of evolving/non-evolving MGUS proposed by Rosinol et al. (p<0.001) (Figure 13.8). Moreover, all patients that actually progressed to MM during the study had an involved/uninvolved HLC ratio above 9.5 at MGUS diagnosis. The authors speculated that suppression of normal plasma cells, indicated by HLC pair-suppression, may be a prerequisite for malignant transformation of MGUS. This may be particularly important for IgG MGUS, due to the high levels of normal IgG-secreting plasma cells that would otherwise prevent invasion of bone marrow niches by tumour cells . 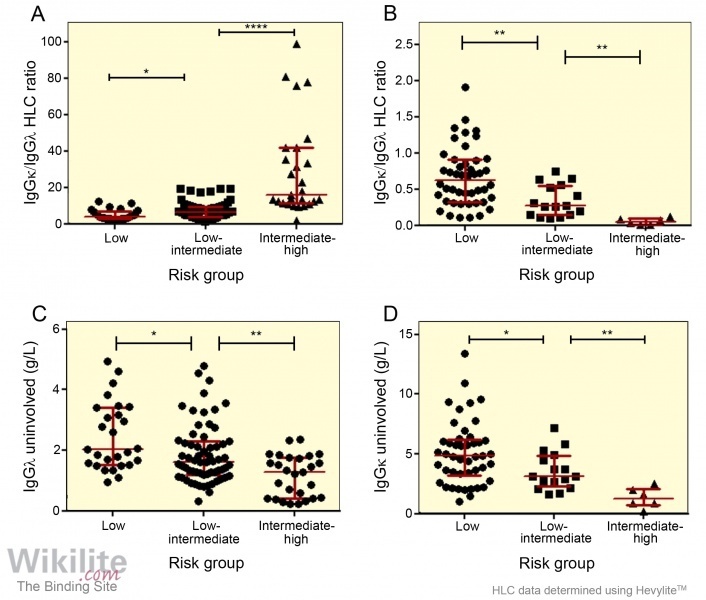 In the future, HLC assays may be used routinely alongside sFLC analysis and other prognostic markers, to guide the optimal follow-up of MGUS patients.